The Independent cause began in Newport in 1765 when a chapel was erected. However the congregation soon folded and was not revived until 1792 when the chapel was re-opened. A new chapel was built in Beaumaris Lane in 1803. This chapel was sold (probably c.1832) & subsequently converted into two cottages, which have been demolished within living memory. A new chapel (twice as large ar the old one) was built in Wellington Road in 1831-2, at a cost of �00. It was described by contemporaries as "a neat stuccoed structure" & "handsome" and had galleries, and opened on 26th September 1832. The burial ground was enlarged in 1850 at a cost of �. In 1851 it had seating for 400 worshippers. On Census Sunday 30 March 1851 it had 170 worshippers at its morning service and 270 at its evening one There were also 100 children at the Sunday School in the morning. 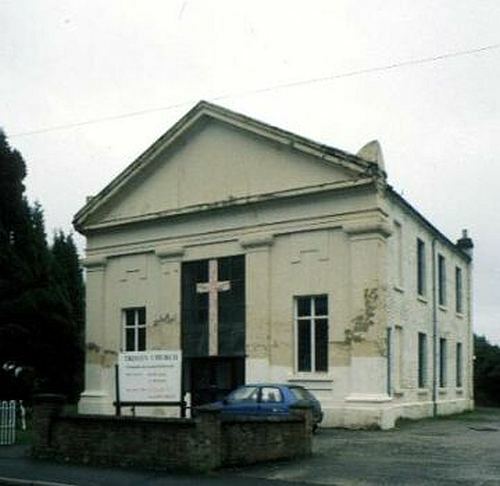 The chapel is still in use today (2017), having joined the United Ref ormed Church in 1972, and been joined in 2001 by the Methodists of Avenue Road. It is now called the Trinity Church. Click here for a view of part of the burial ground.